You’ve heard a lot about the value of driving traffic to your website and converting suspects to prospects, and prospects to customers. Obviously that is a critical objective to include in your marketing mix. A major element is to deploy effective landing pages to help guide visitors quickly to the concise information they are seeking. 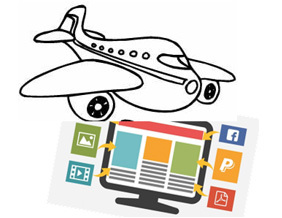 Landing page design, development and deployment is a marketing specialty. So for guidance and direction, we decided to ask the landing page experts … Kevin Jonas, owner of Jonas Marketing and Chris Fawcett, founder of Third Marble Marketing. Then we’ll follow their direction with examples of landing page successes as described by Rich Moncure, principal at OnHold Marketing. Conceptually, landing pages are pretty simple … they are standalone web pages specifically created to support a promotion, marketing campaign, or AdWords program by funneling visitors from an external link. They are often designed to encourage a conversion, like a purchase, phone call, or form submission. Landing pages also offer businesses the ability to accurately track the visitor statistics and conversion results of a campaign since they usually exist outside the framework of the full business website. A well crafted landing page can be an excellent way to drive sales, gather data, grow an email list, or increase brand awareness. When you review your landing page analytics, you may find a particular page is attracting a lot of traffic to your website. Assuming the traffic is relevant to your offerings, consider transforming that page into a high-converting landing page. The format of a landing page can vary, but its purpose is to lead the visitor step-by-step through information that will ultimately lead to a strong call-to-action. Most well-designed landing pages will have very few distractions or links to other pages or content. You won’t see links asking people to “click here to learn more” or do anything to distract them from continuing to the next section on the page. First, you need to identify and solve the problem the visitor might have. Then demonstrate your solution to their problem. 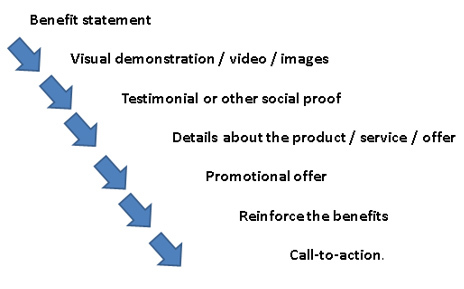 Then prove that your solution works with testimonials or other social proof. Answer questions that the typical buyer may have. Finally present the offer with a reminder of their problem, why your offer is the best and ask them to take action. At On Hold Marketing, we made the decision to create landing pages on our PAID Google ads. Instead of offering our main home page on a Google Ad, we decided to create pages that directly address the reason somebody searches for our service … sales information. Our home page offers more written content than a shopper is seeking. Visitors would need to navigate specific tabs and comb through content that require more clicks and navigation, just to get the concise information they were seeking. So as we choose to target specific market niches, their responses are directed to a landing page that addresses their particular industry or profession. Here are examples of what is presented to four audiences that we have identified as prime prospects for our service. As you click through the above links, you’ll see that each speaks directly to the market segment that we attracted … with the added benefit of video reinforcement of the benefits we deliver. So, there you have it … all the elements of a winning landing page, plus contact info for the experts that can help you turbo-charge traffic to your website and conversions to sales. Previous post SEO AND PPC: 2 ACRONYMS TO PUT YOUR COMPANY OVER THE TOP WITH TOP OF MIND AWARENESSNext post DIGITAL AGE MAKES IN-PERSON RELATIONSHIPS OBSOLETE ... OR DOES IT?